The Grove Minting Company commemorates the 40th anniversary of 1977 to United States Mint Engraver, Frank Gasparro's Pattern Liberty Dollar. This Flowing Hair Liberty Head Obverse / Eagle in Flight Reverse features a Liberty Head and Liberty Cap on Pole, with a Flying Eagle featuring 13 Stars and 10 Rays. Final strike in piedfort style, 1/2 Ounce .999 Silver. 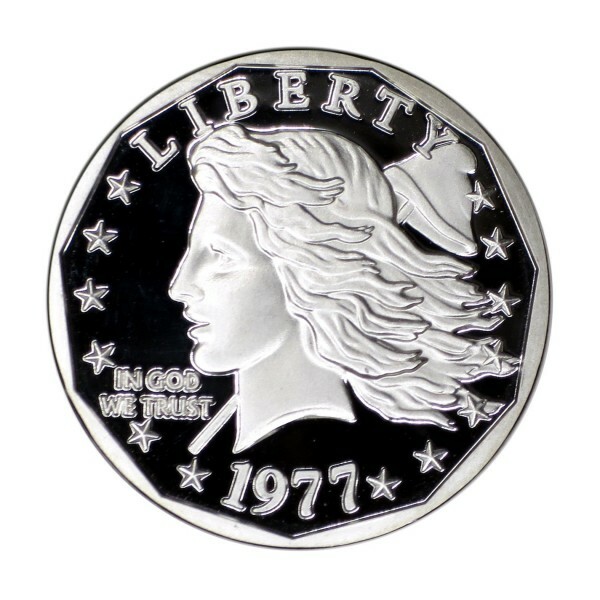 Celebrating the 40th anniversary of the 1977 Liberty Dollar. Celebrating its 2017 release, the Grove Minting Company pays homage to Frank Gasparro, the tenth Chief Engraver of the United States Mint, on what would have been the 40th anniversary of the 1977 Liberty Head Small Dollar. This commemorative is based upon Gasparro's original 1977 Flowing Hair Liberty Dollar trial strike, which was conceptualized from imagery now held at the Smithsonian’s National Museum of American History, donated by Gasparro’s daughter in 2009. Within that collection appears a unique newspaper clipping of a fashion model wearing an Albert Nipon designer suit. With the quick stroke of a pen, Frank turned this fashion model’s profile into the portrait of a Flowing Hair Liberty, which progressed into a final sketch for the coin’s obverse. His reverse design sketches iterated through different variations of an Eagle in flight, bursting through the rays of the sun in the background, complete with 13 stars symbolizing the original colonies. This superior design however would later be replaced and adopted into the Susan B. Anthony Small Dollar coin in 1979, containing similar design elements, but to the disappointment of many who preferred the initial visualization. 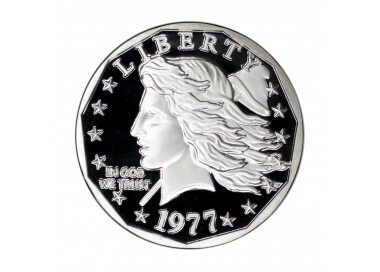 Fortunately, the Flowing Hair Liberty motif was utilized prior in the obverse rendering of the 1969 ANA convention medal, to which 400 examples were struck. But, herein lies a small mystery. The Albert Nipon brand launched in 1972, so the inspirational newspaper clipping and subsequent rendering for the 1977 Flowing Hair prototype must have been envisioned by Frank Gasparro before he ever saw the newspaper, in the creation of the 1969 ANA medal. The newspaper sketch could have rekindled thoughts in persisting his envisioned design forward to 1977. Attentive in exacting detail to the original proposed depiction, this commemorative includes the 11 sided inside border, which was introduced to aid the public in distinction from the US Quarter. The obverse Liberty Head and Phrygian Liberty Cap on Pole hold true to the intended delineation. The reverse features an Eagle in flight, complete with 13 Stars, 10 Rays, and the Grove Minting Coat of Arms. The commemorative is proof-struck in .999 Fine Silver at 25mm wide, weighing 1/4 Troy Ounce with a plain edge. 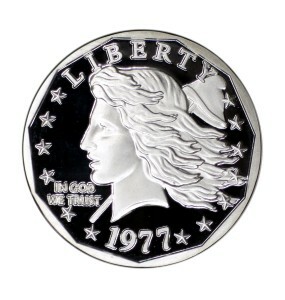 The production of the 1977 Liberty Head Dollar Silver Piedfort Commemorative is limited to a striking of 250 pieces. These pieces can be differentiated from the original Nickel variety, with the additional feature Edge Strike of ".999 FINE SILVER"
Strike notes: The production of this .999 Fine Silver variety is twice as thick as the previous silver variety. Striving for perfection with the fill on this design, this final 1/2 Ounce issue exhibits an outstanding relief and mirror proof finish. Housed in a premium capsule with domed obverse lid to accommodate the higher relief. Original suggestion for the idea of creating a piedfort strike submitted by John Wang. This is a beautiful Design. Its just too bad it wasn't used for an actual Coin. 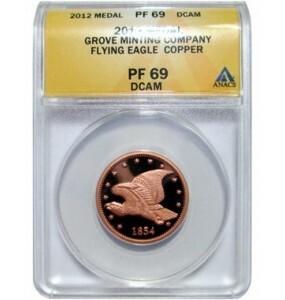 This "token" makes current US Mint product look really bad. Glad I was able to get one of these. Awesome and love the story! If it wasn't for JBCOINSINC on YouTube, I would never have known about these. The last time they came out in Silver I wasn't fast enough. I got the Nickel versions and there beautiful! I am getting 2 this time as well!